Product prices and availability are accurate as of 2019-04-09 20:36:42 EDT and are subject to change. Any price and availability information displayed on http://www.amazon.com/ at the time of purchase will apply to the purchase of this product. Tired of seeing snack wrappers, toys, books, & other kid stuff strewn all over your vehicle? Bring peace and tidiness to your backseat at last with the Giggle Sprouts Universal Backseat Car Organizer. Featuring deep, spacious pockets everywhere, this smartly designed caddy has a place for everything while keeping kid essentials easily accessible. Long car ride? Your new organizer also has a top pocket that's specially designed to hold an iPad or other tablet. You can plug earphones in to give your child a private viewing experience (while you savor the peace and quiet). Your Giggle Sprouts Backseat Car Organizer installs quickly onto most headrests using the attached adjustable strap. It works with both removable and non-removable headrests. Like to travel and take walks with your little one? Parents love how the Giggle Sprouts backseat organizer converts to a handlebar stroller bag in an instant. It even has a hidden pocket to keep your valuables (phone, keys, etc.) out of plain sight. Sometimes you just need a break from the bickering and 20,000 questions. 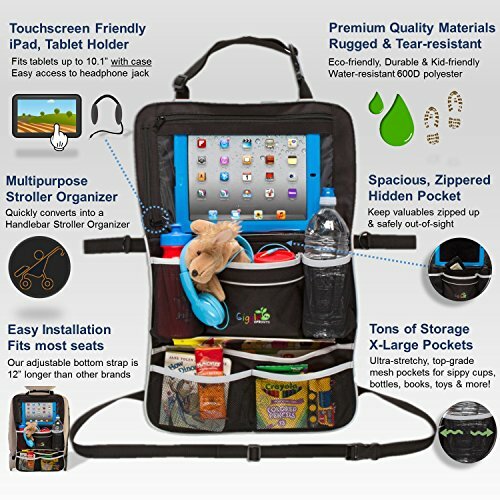 Moms and dads rave about this organizer's touchscreen-friendly zippered pouch that holds an iPad (or other tablet under 10.1") for hands-free viewing. Great for road trips and family vacations. The Giggle Sprouts Backseat Car Organizer makes an excellent gift for expecting parents. FOR CAR OR STROLLER: Keeps baby & children's items neat & organized when you're on the go! 8 spacious pockets (more than other brands) plus a hidden pocket offer tons of storage options. Perfect for road trips, family vacations & park treks. 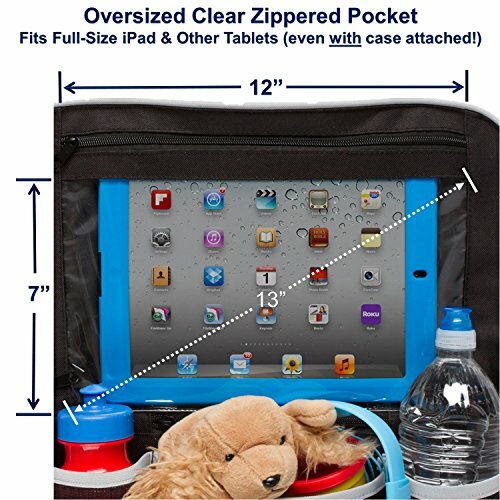 TOUCHSCREEN FRIENDLY IPAD POCKET: Extra large zippered pouch fits most tablets (up to 10.1") & portable DVD players for viewing of movies & more. Side pocket provides convenient access to headphone jack, charger port, etc. DURABLE HEAVY-DUTY MATERIALS: Made of rugged, water-resistant 600D polyester that's kid-friendly and eco-friendly. 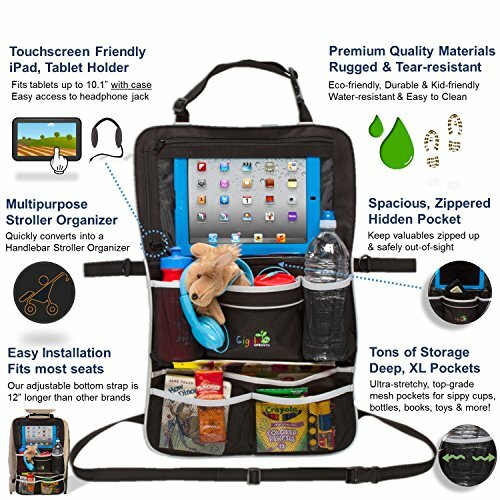 Ultra-stretchy, top-grade mesh pockets hold sippy cups, books, water bottles & more securely without tearing. Quality zippers designed to last for years. EASY INSTALLATION, SECURE FIT: Our adjustable bottom strap with quick-release buckle is nearly 12" longer than other brands, allowing our organizer to fit most vehicles and strollers in stroller mode. Simple to clean with a damp cloth. LIFETIME 100% SATISFACTION GUARANTEE: This product is designed to last for years! If you have any issues at all, simply let us know. We'll either replace your organizer at no cost or issue a full refund.